3614 ✉ 2a 10 C. Black, fresh colors, three sided with wide margins, above touched, right tiny crease, on cover with red grid cancel and additional pen cross with full content and additional red two ring cancel \"CLEVELAND 20. 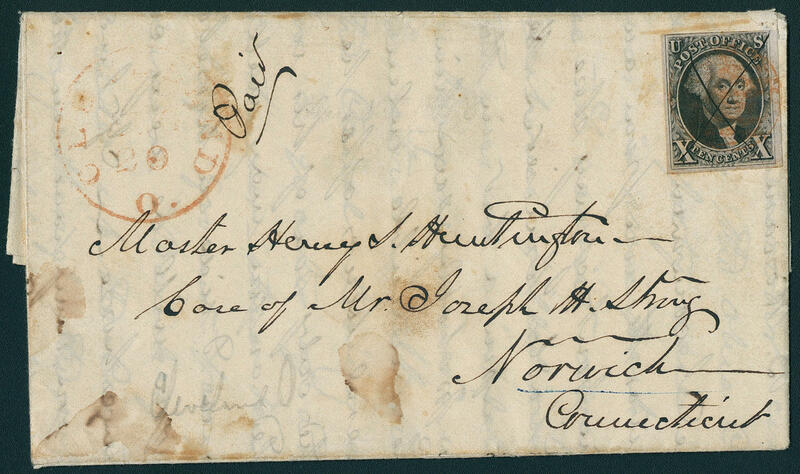 August (1848) \" to Norwich. This is the third-early letter, which from Cleveland known is. An especially interesting and exceptional rare cover! Photo expertize Eichele. 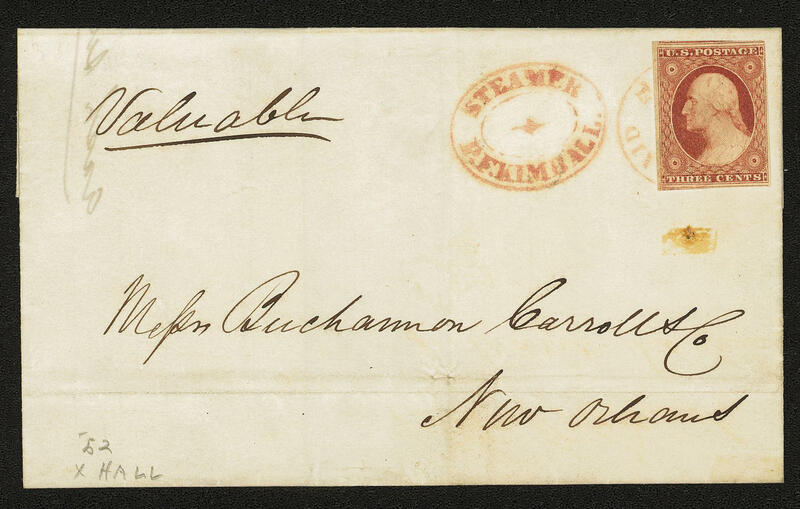 3615 ✉ 4 3 C. Washington, three sided with wide margins, right touched, fresh colors on decorative cover with red single circle postmark and additional red election cancel \"STEAMER P. F. KIMBALL\" to New orleans. Provenance: Ex collection Haas. 3616 ✉ 18 3 C. Red-brown, fresh colors, small browning point, on decorative colored illustrated \"PATRIOTIC cover\" with two ladies / American Flag / anchor from \"CHARLES MAGNUS 12 FRANKFORT ST. N. Y. \", slight traces, a very decorative and rare cover! 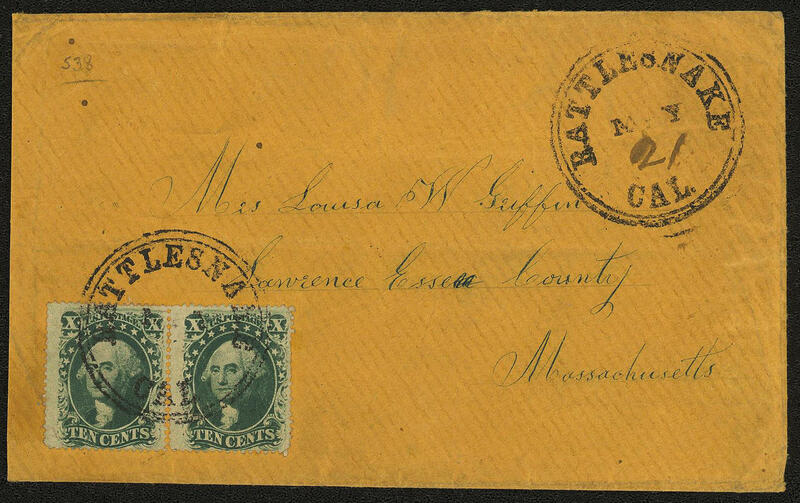 3617 ✉ 11 10 C. Washington, two examples as having bright colors multiple franking on cover with two ring cancel \"BATTLESNAKE\" on cover to Massachusetts. Provenance: Ex collection Haas. 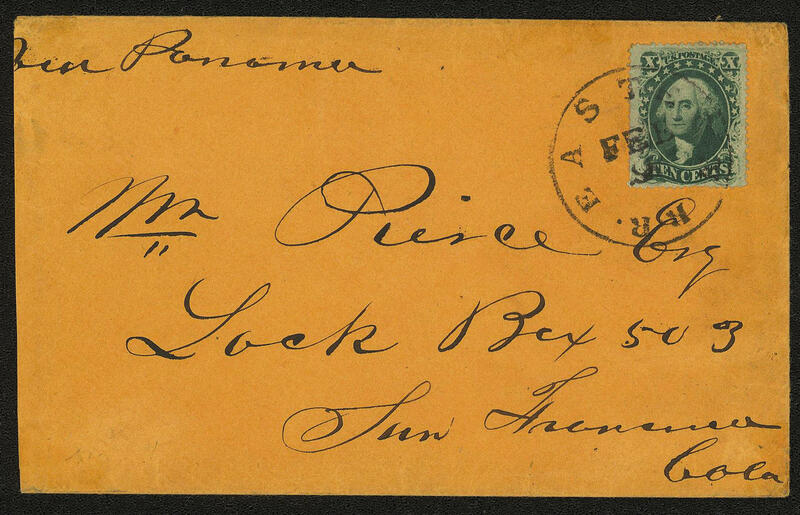 3618 ✉ 11 10 C. Green, fresh colors on very nice cover, left little shortened, with scarce clear single circle postmark \"EASTERN R. R. \" (railroad cancel) with handwritten notation \"VIA PANAMA\" to San Francisco, provenance: Ex collection Haas. 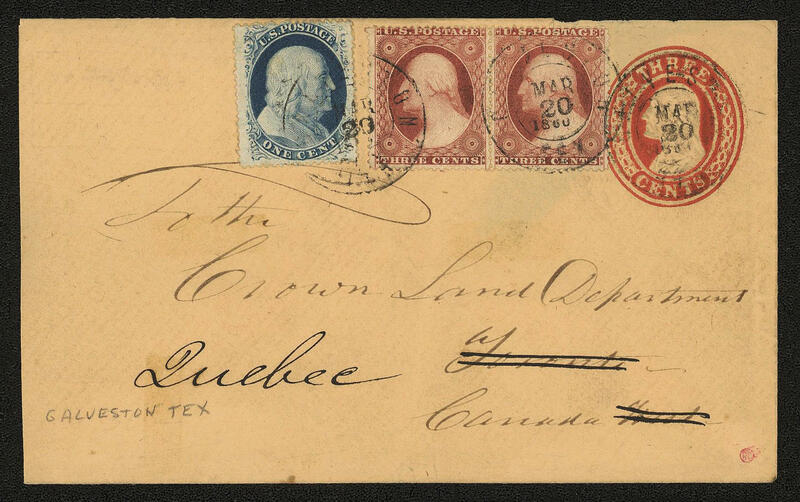 3619 ✉ 16,18 1 C. Blue, 3 C. (2) as additional franking on postal stationery envelope 3 C. From \"galveston\" from the year 1860 to Toronto / Canada and forwarded to Quebeck with transit and arrival postmarks, provenance: Ex collection Haas. 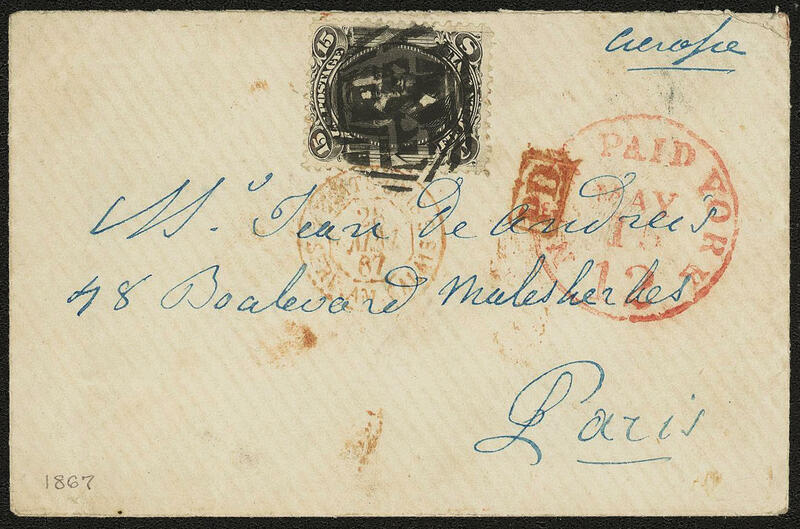 3620 ✉ 22 15 C. Lincoln, decorative single franking on small-format cover from \"NEW YORK\" to Paris with scarce geometric stamp, provenance: Ex collection Haas. 3621 82 30 C. Columbus, fresh colors, extraordinarily good centered, in perfect condition unused with complete original gumming and trace of a hinge. An exceptional nice copy! 3622 ✉ 224C 2 C., horizontal pair and strip of three (a value defective) on registered cover of the american militaries in Siberia with violet stamp the 4. Division (APO746) from 9. 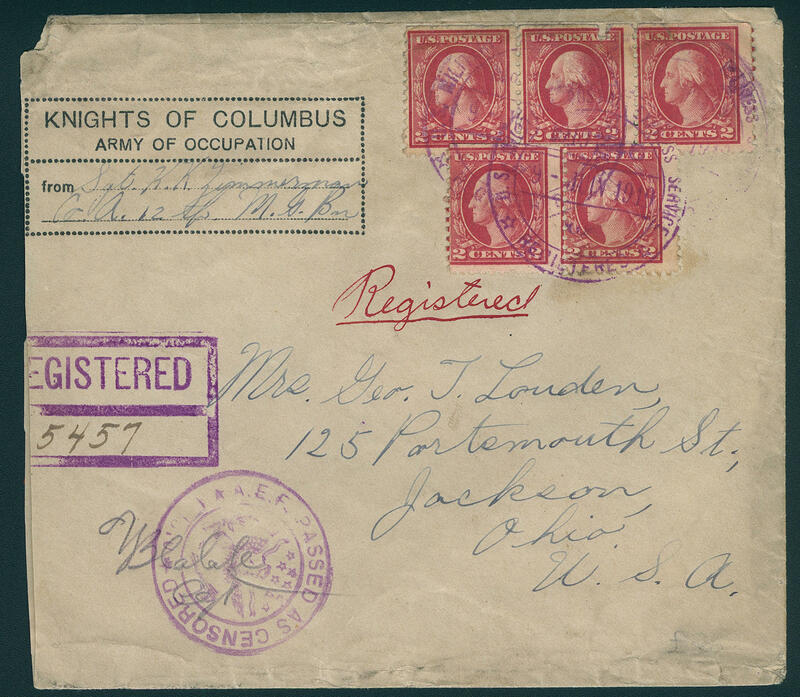 June 1919 with censorship stamp to the United States, cover left slightly shortened and some rough opened. An extraordinary and rare document! 3623 ✉ 236C 15 C. Grey, in perfect condition on censored letter from 1917 to Russia with scarce adhesive label from post office in New York \"SERVICE IS SUSPENDED\", right rough opened. An extraordinary cover, the because of the Russian revolution not was transported! 3624 ✉ 327 1, 30 Dollar Zeppelin 1930, fresh colors, very well perforated and centered on beautiful small-format Zeppelin cover from \"VARICK 30. April 30. 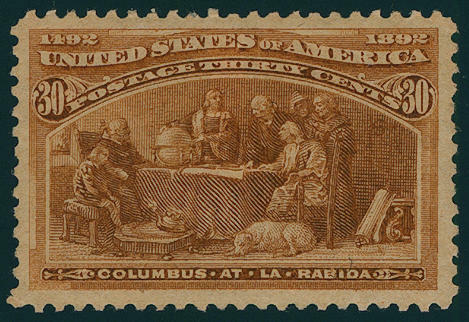 \" with both special confirmation stamp in red respectively violet to Lot-Angeles with on the back transit stamp. 3625 ✉ \"WASHINGTON D. C. JAM. 11.60. \", meter cancellation on Catastrophes letter of the Press place of the German Message with content (newspaper \"THE bulletin\" with illustration from Adenauer and Lübke) with violet two-line cancel \"DAMAGED IN FIRE IN RAILWAY MAIL CAR AT CADIZ CALIF. \" to San Diego. 3626 ✉ \"CUYAHOGA if OHIO MR. 26.1960\", two ring cancel on Catastrophes letter with twice mounted violet three-line cancel \"DAMAGED IN FIRE IN RAILWAY MAIL CAR DAGGETT, CALIFORNIA\". Rare! 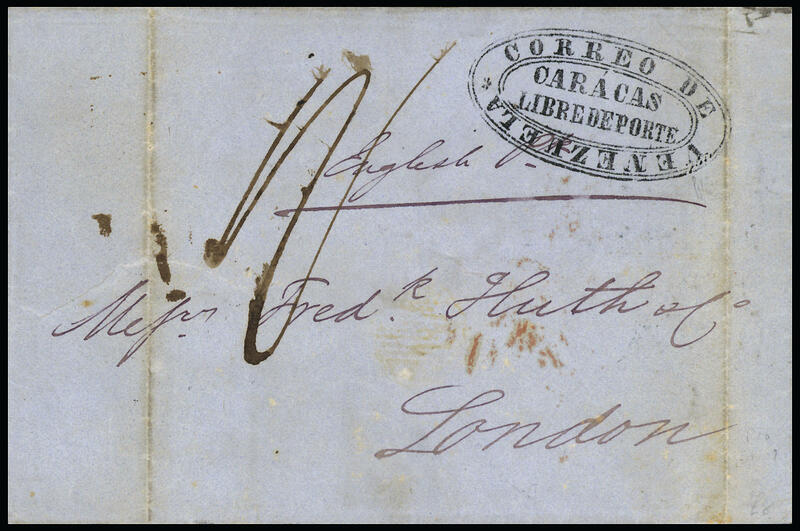 3613 ✉ \"CARACAS LIBRE DE PORTE CORREO DE VENEZUELA\" very rare oval cancel razor-sharp on cover to London, rear stamp of the British post office \"ST. THOMAS 17 NO. 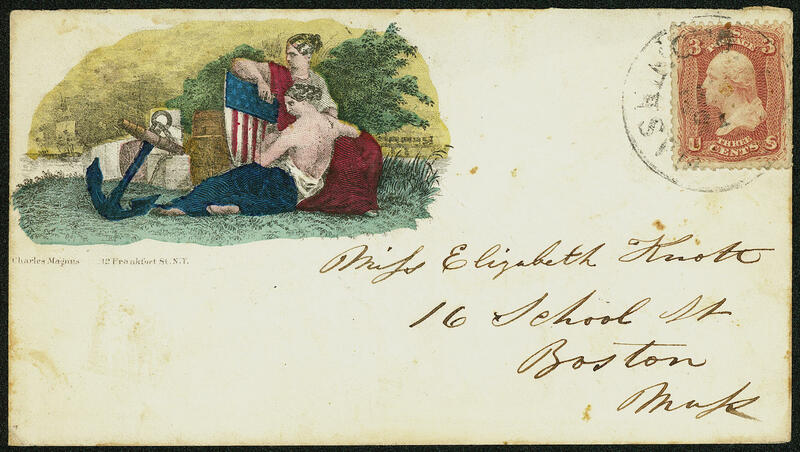 1850\" as well with arrival postmark. 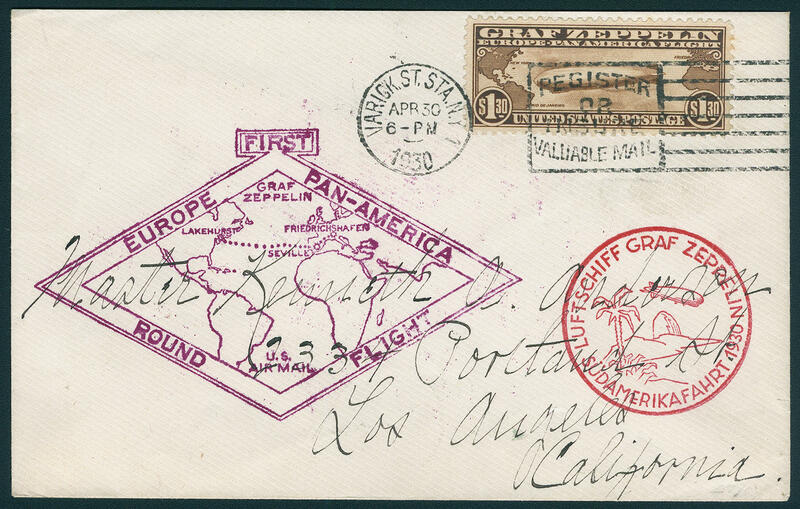 One of the rarest pre-philately covers of this area. Photo expertize Peter Holcombe. 3627 ✉ 100,109 1 / 2 P. Rose and 1 P. Orange as additional franking on postal stationery letter-card 1 P. With duplex stamp \"MELBOURNE 28. MR. 93. 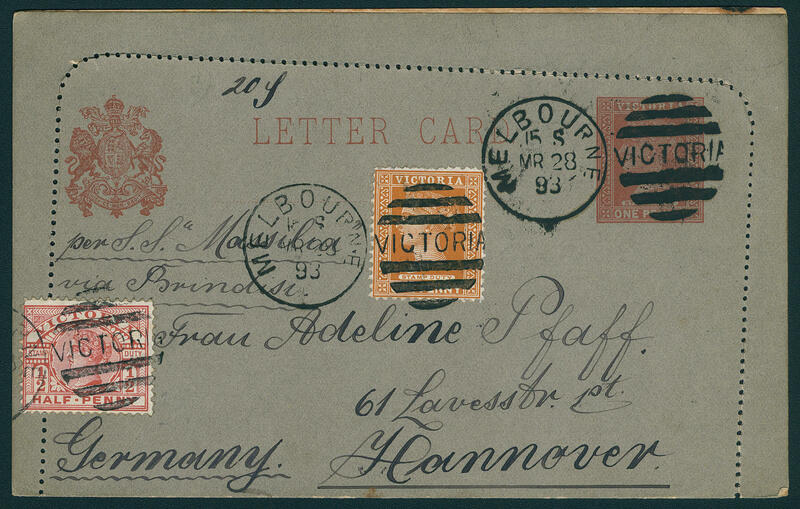 \" to Hanover with arrival postmark. An especially attractive and attractive combination! 5393 ∆ 1II 2 Pfg. 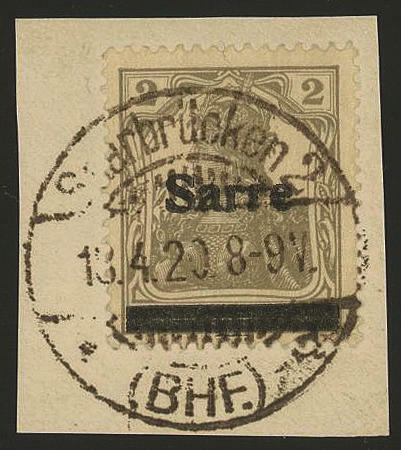 Yellow gray, the scarce type II, fresh colors and very well perforated on beautiful letter piece, all perfect used \"SAARBRÜCKEN MALSTATT 17.3.20. \". An outstanding quality for the highest standards! Photo expertize \"the quality is perfect\" brown BPP. 5394 ∆ 1IIB 2 Pfg. 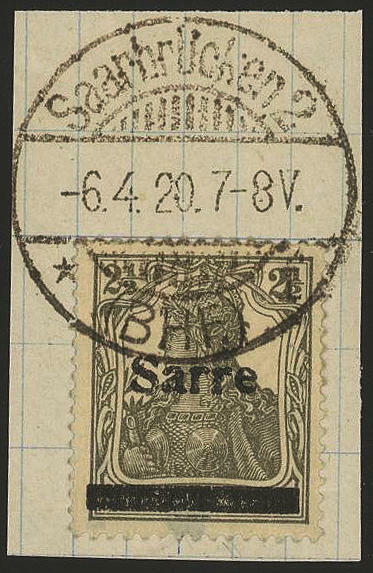 Sarre-Germania, the scarce type II with overprint error \"horizontal divided bar\" on very nice letter piece, all perfect used \"SAARBRÜCKEN 13.4.20. \". A piece of dream for the highest standards! Photo expertize \"the quality is perfect\" brown BPP. 5395 ∆ 2aII 2 ½ Pfg. 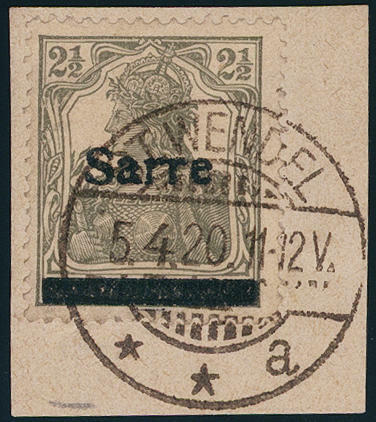 Sarre-Germania, olive gray, scarce type II, fresh colors and very well perforated on beautiful white letter piece with clear two ring cancel \"ST. WENDEL 5.4.20\", an exception copy for the highest standards, photo expertize brown BPP. 5396 ∆ 2aIIA 2 ½ Pfg. 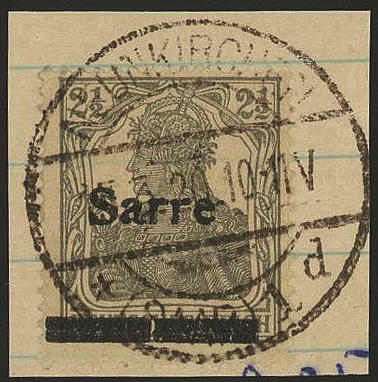 Sarre-Germania, olive gray, the very scarce type II with variety \"vertical divided bar\", on wonderful letter piece, perfect centric and neat cancelled with full stamp \"NEUNKIRCHEN 15.3.20. \". An outstanding quality for the highest standards! Photo expertize \"perfect quality\" Burger BPP. 5397 ∆ 2aIIM 2 ½ Pfg. 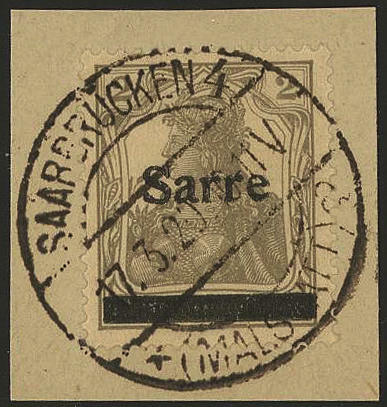 Olive gray, the scarce type II with overprint variety \"upper sheet of the S broken\" fresh colors and very well perforated on beautiful letter piece, all perfect used \"SAARBRÜCKEN 6.4.20. \". A piece of dream for your highest requirements! Photo expertize \"the quality is perfect\" brown BPP.